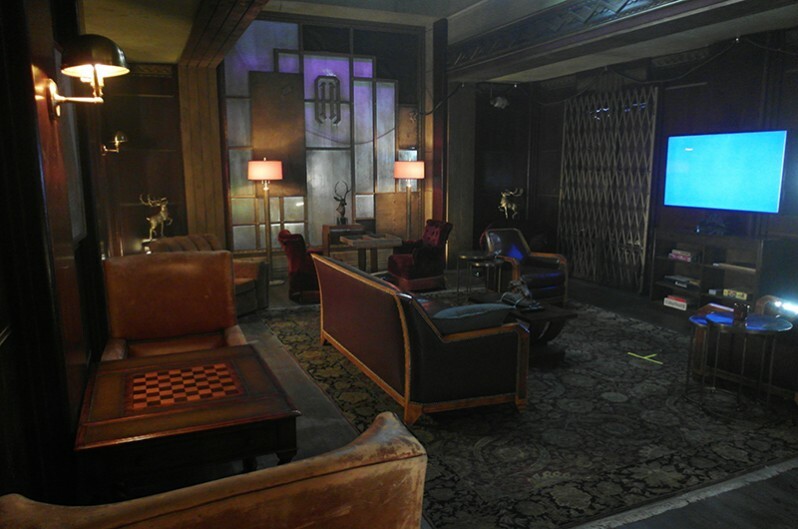 The facility is in the penthouse of an all but abandoned downtown LA Art Deco hotel, yet it is equipped with high tech security [albeit a bit jury-rigged] and state-of-the-art technology that can heal its members in record time. Image ©2018 Global Road Entertainment. 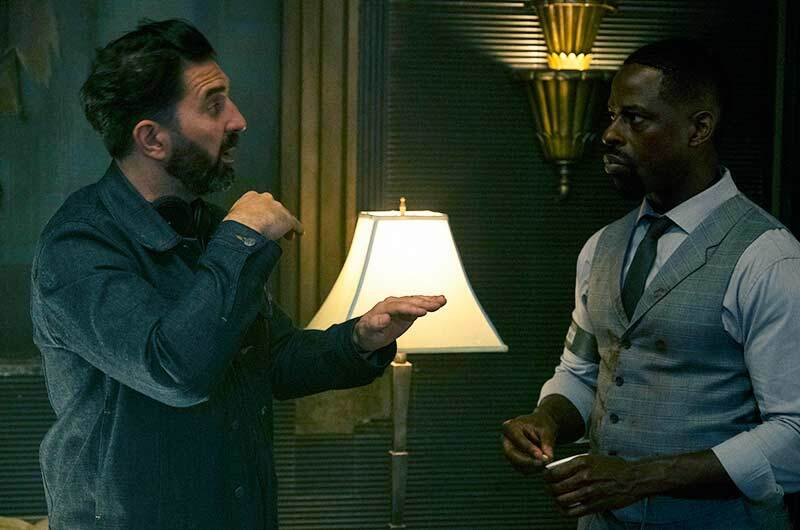 Writer/Director Drew Pearce with Actor Sterling K. Brown. Photo by Matt Kennedy ©2018 Global Road Entertainment. Photo by Sam Avila ©2018 Global Road Entertainment. 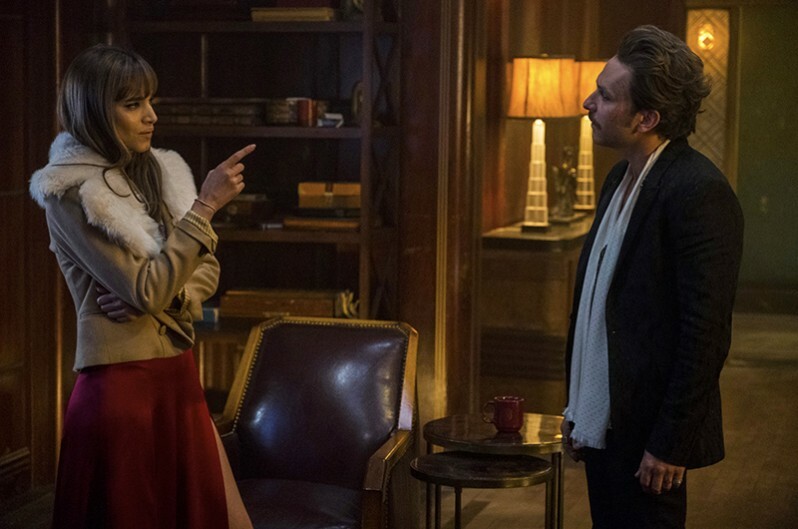 Hotel Artemis promises anonymity. Each penthouse suite has its own name, which is transferred to the residing member upon arrival. The wear and tear of the years are visible...but the original quality shows through. 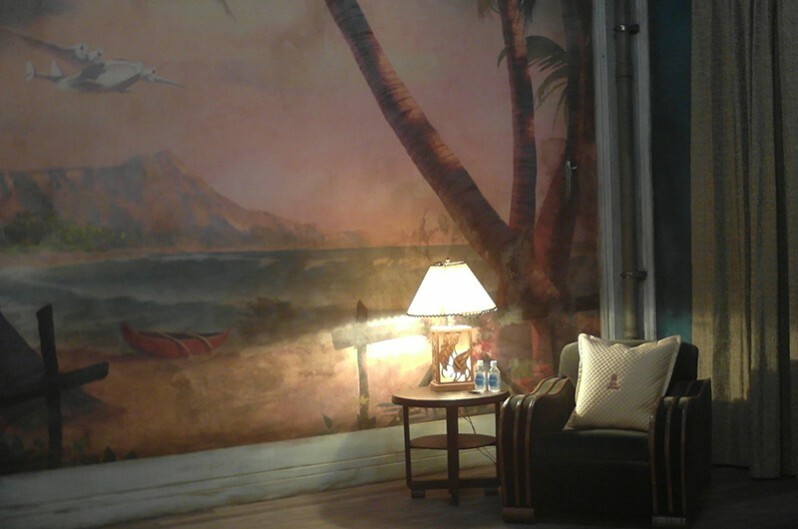 Each suite has the sitting room side, with the original mural from the 1920s. 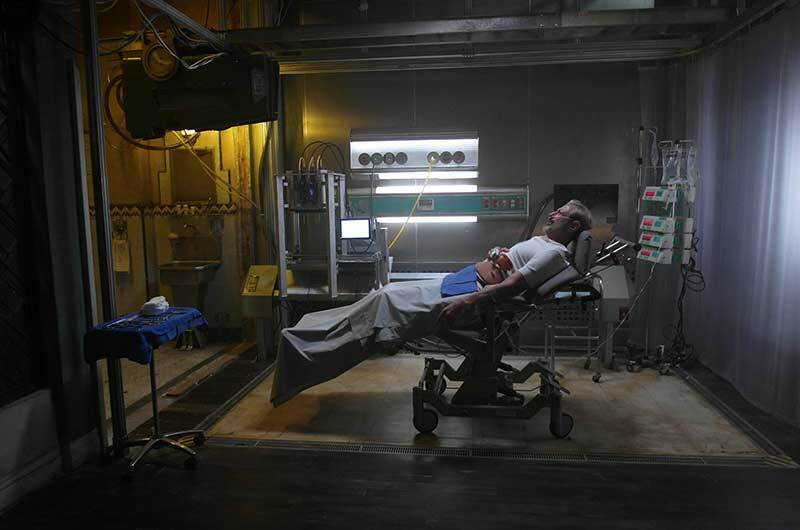 The other side enfolds the private medical facility for each patient, where there are some extremely modern updates, from body scanners to 3-D printers that can replicate human organs to the robotics The Nurse uses to repair her patients. Accordion scissor window covers were installed to make the hospital look more dangerous. 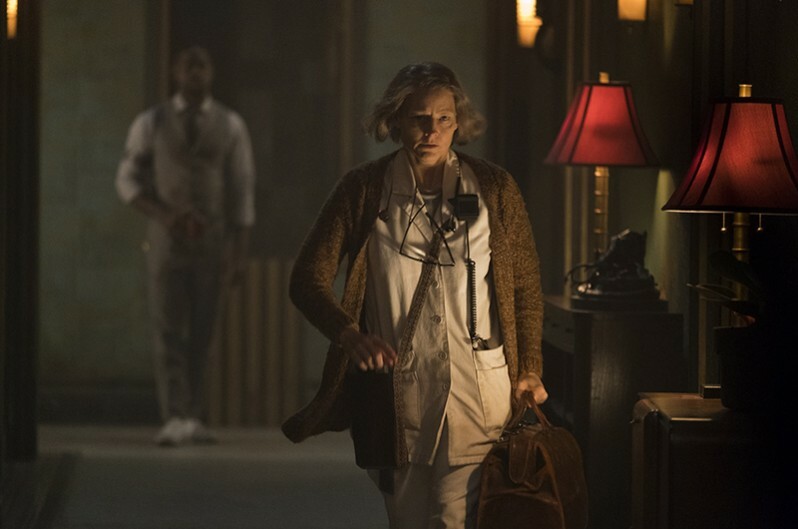 Set Decorator Rosemary Brandenburg SDSAI and team, including Set Dec Dept Assistant Chase Helzer, SDSAI Associate, researched future hospital bed/gurneys. Budget restraints didn’t allow for them to have one built, so they put together a prototype of sorts from a specialized “patient transfer chair” they sourced in Virginia, which they then had reupholstered by SDSAI business member Omega Cinema Props. 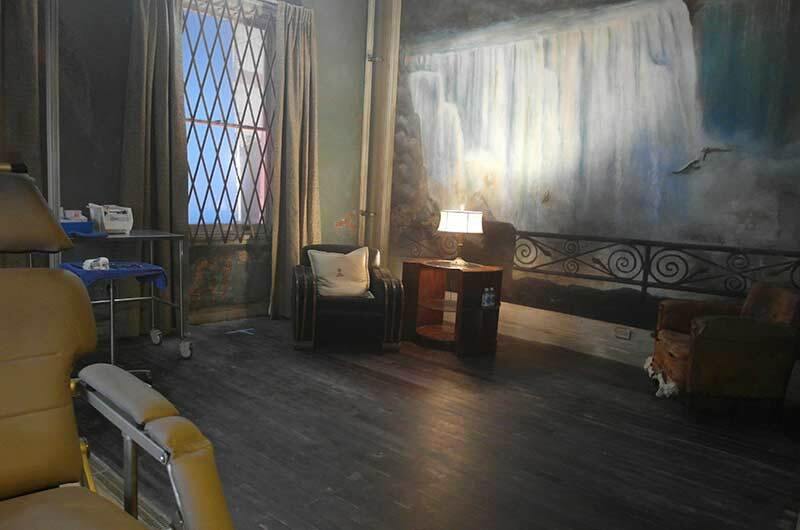 Graphic Designer Dianne Chadwick designed the murals, which were printed, and then treated to effective abuse by scenic artist Mark Boucher and his crew. Jodie Foster. Image ©2018 Global Road Entertainment. The Wolfking [Jeff Goldblum], his son [Zachary Quinto] and his enforcers have arrived, but The Nurse [Jodie Foster] only allows him entry. The others are not paid members, have no chip. Rules are rules. In actuality, the team had only enough of a budget to build one corridor. The director says it was Brandenburg’s task to ensure it looked like many! 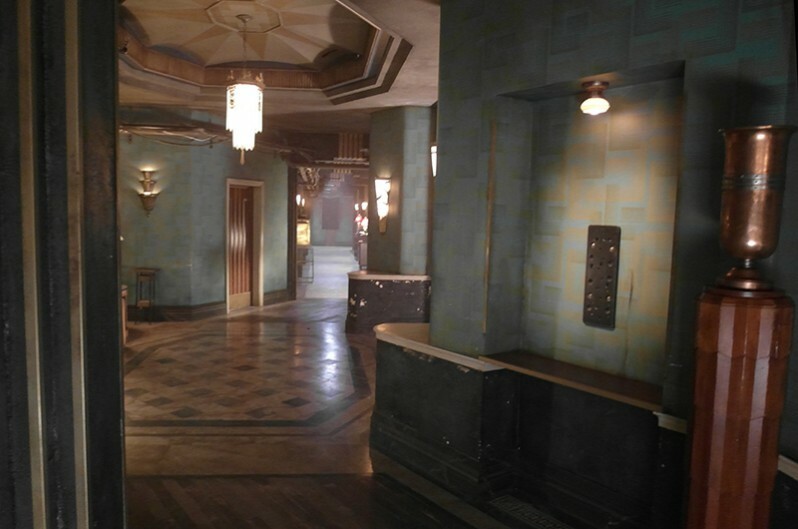 And yes, all of the interiors were stage-built, not shot at an actual hotel location. 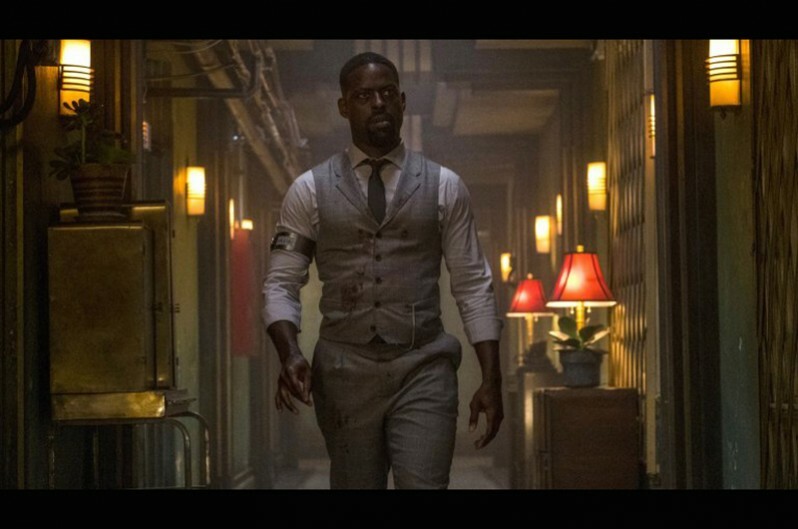 Sterling K. Brown. Image ©2018 Global Road Entertainment. 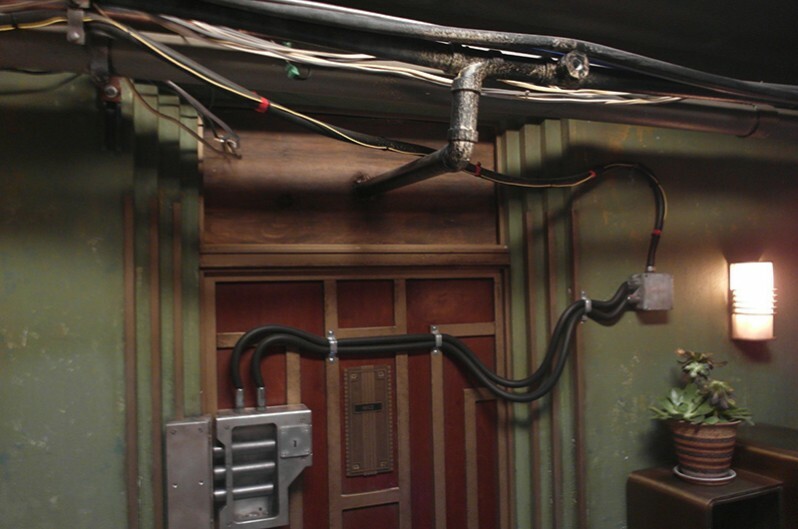 The door locks, wiring and pipes were added to create a futurist touch, and, again, to show that there were layers of retrofitting done through the years. Themed door panels subtly define each of the rooms. 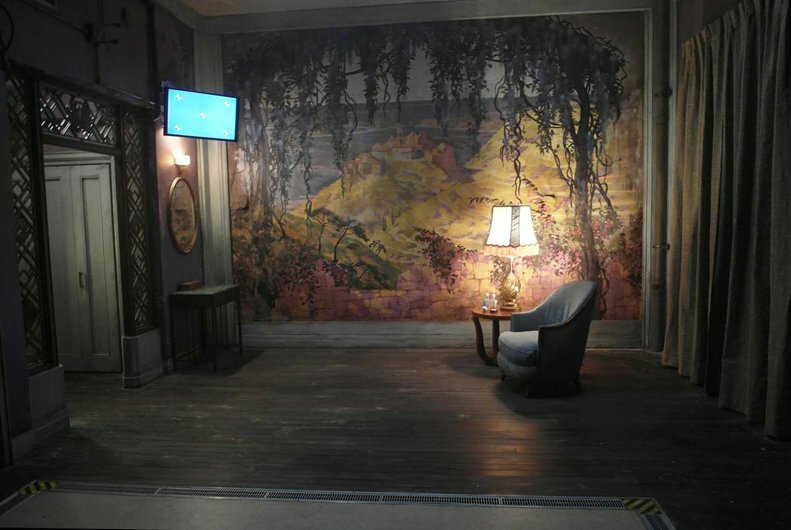 Credit goes to Production Designer Ramsey Avery, Art Director Sam Avila, and Graphic Designer Dianne Chadwick for this effect. Pewter and bronze sculptures of stags represent the hotel’s namesake goddess, Artemis, the Greek goddess of the hunt and hunted. Neither the dartboard nor billiards table are still in use, as their elements could be used as weapons. 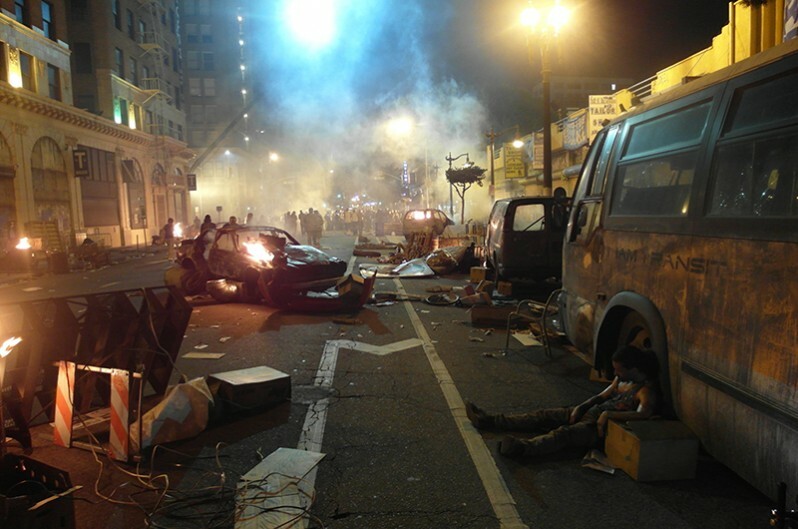 Again there were limited funds for the riot scenes and the homeless encampment. 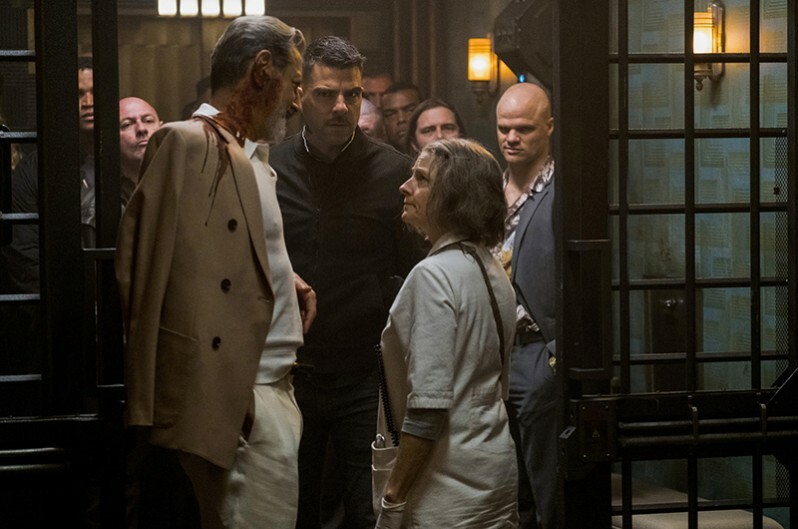 SET DECOR had an insightful chat with Drew Pearce, film writer and first time director, on the collaboration involved in bringing about his film HOTEL ARTEMIS. 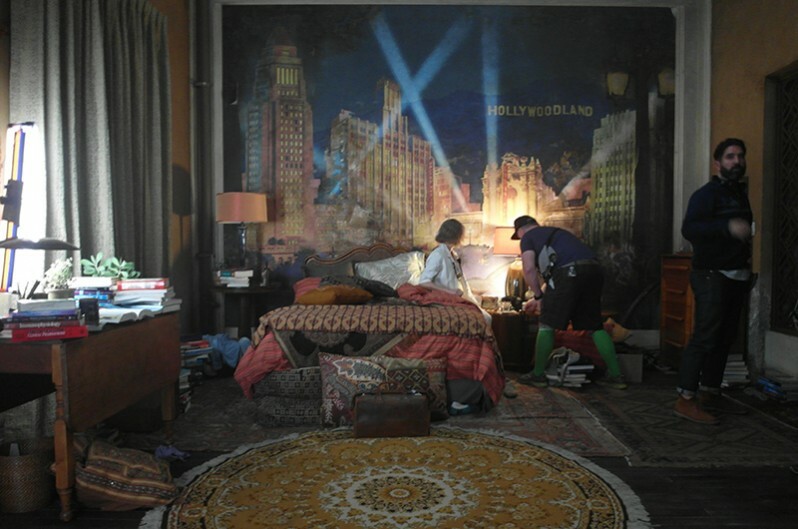 This transplanted Brit and his cohorts give us a noirish, darkly witty paean to a hidden Los Angeles, with a stylistic twist that incorporates a derelict hotel which had its day in the 1920s, and in its current riot-torn 2028, serves as a secret hospital for violent criminals. There’s a thing that you find with Los Angeles architecture and life that I think you don’t get in European cities or the East coast cities… Because the history of the city is quite short, you get a sense of all of those layers of history kind of simultaneously and that really informed the Artemis’s aesthetic. 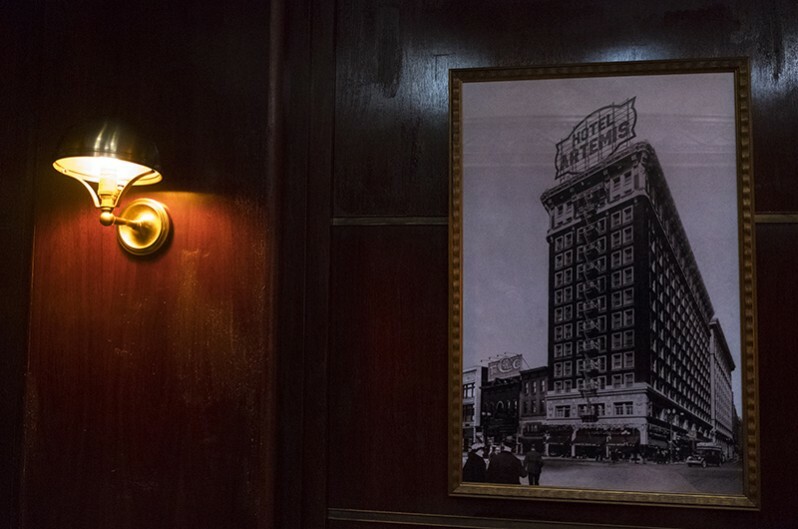 It’s a hotel from the 1920s in downtown Los Angeles, which much like everything in that area, by the time of the ‘70s, it was rather dilapidated. 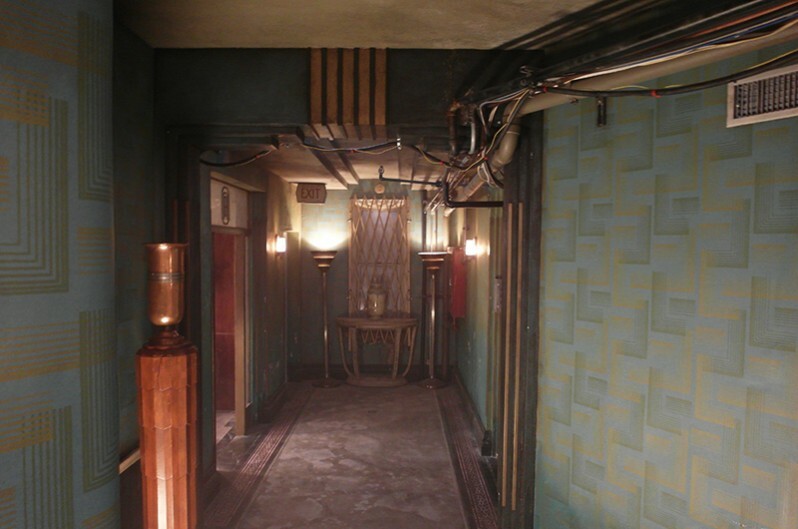 However, the busted Deco penthouse suites have been converted, jury-rigged with medical and tech equipment all the way through to 2028, when the movie is set. So you have a hundred years of layers there. Ten of those years don’t exist, of course, because it’s set in 2028, and we’re in 2018. 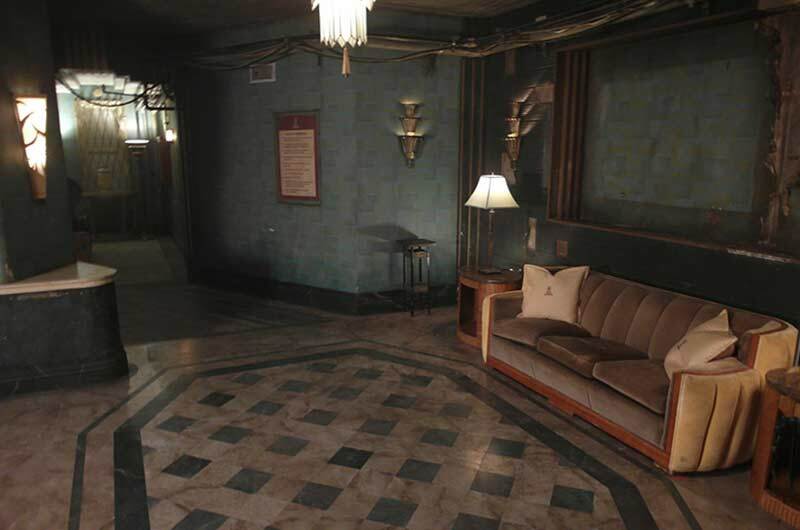 But the previous 90 years have existed, so Rosemary was able to at least kind of cherry-pick from flea markets and prophouses little aspects of LA furniture and interior architecture that felt authentic to their period when they would have been inserted into this building, and, hence, had a kind of legitimacy as well. What I don’t want to do is start every sentence with “Our movie had no money, but...” But unfortunately that does kind of hover over everything that my production departments were dealing with. And, you know, Rosemary, as set decorator, more than anyone. She was essentially tasked with decorating a world in a way that creates a universe whilst not having any budget to speak of in order to do that, particularly when there are whole items of technology being created, partly by her department, party by the props department. The challenge was enormous because we barely had the budget to fill 2 rooms and Rosemary is the one that is trying to sell that we’re in an entire floor of an old hotel. One of the things that was so challenging, but also was fun in its own way, is that we could only afford to build 2 bedrooms and one corridor. 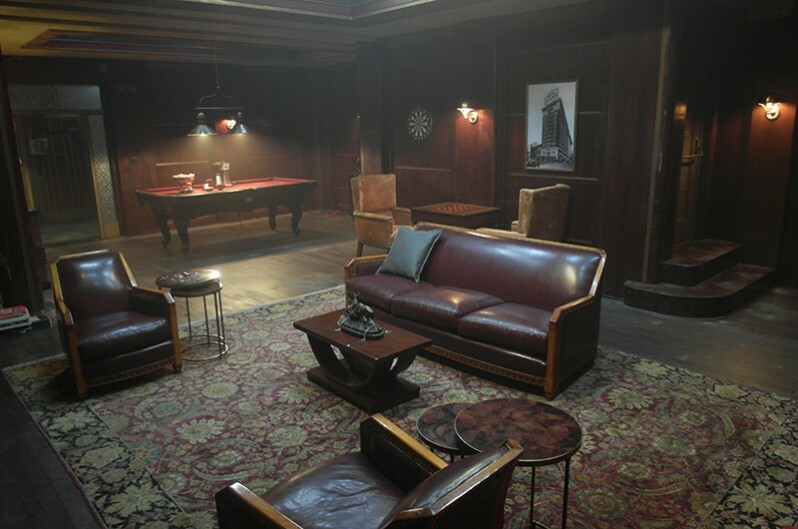 That was all we had, plus one multi-function room that starts as a games room and then is redressed as the bar. 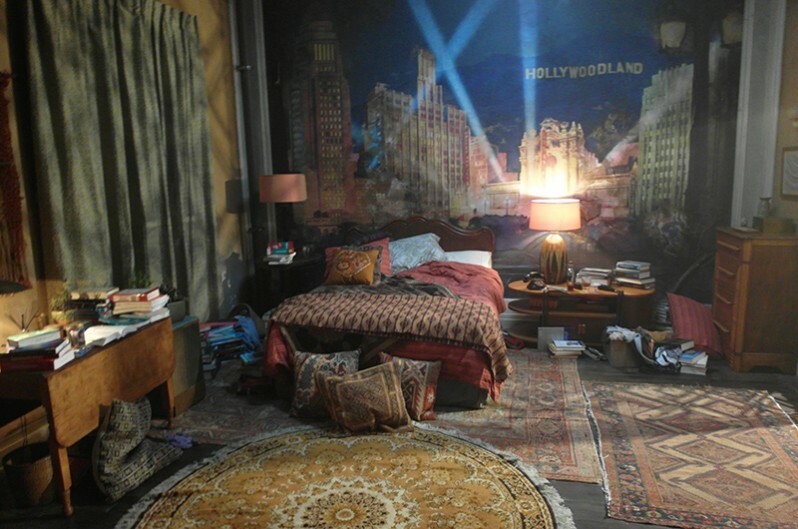 And so one of the things that she then did was follow the theme of each room and use the re-dressing to basically turn it into an entirely new character. Once every 3 days. I love that the logo went all the way through to being in the promotional material, which so seldom happens, that a design element, that the elements themselves become part of the campaign. And yet, the logo panel in the games room was the bane of my life, because I wanted that there be a window there, but again the budget meant that we couldn’t even do a poor man’s version of the idea of life passing by. We had to find a very old school solution which was that at some point, they had painted out windows, a few of them had been broken...so we paneled them up with wood and gaffer’s tape and stuff. But I think we got away with it...it actually reads with a reality to it. Again, on a budget, trying to find the quantity of those sconces is always the killer thing. One of the things that was helpful, though, because we wanted this sense of accumulation through time, shades and light bulbs could be random, could feel like they had come from different places. 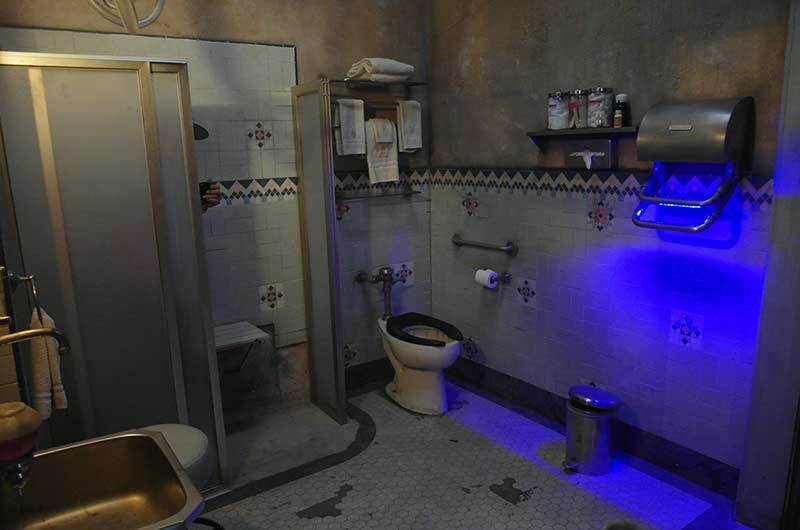 In fact, even though the sconces are the same, occasionally we would change up the light inside it, because Everest hasn’t really taken that much care to make everything seem matching, you know. 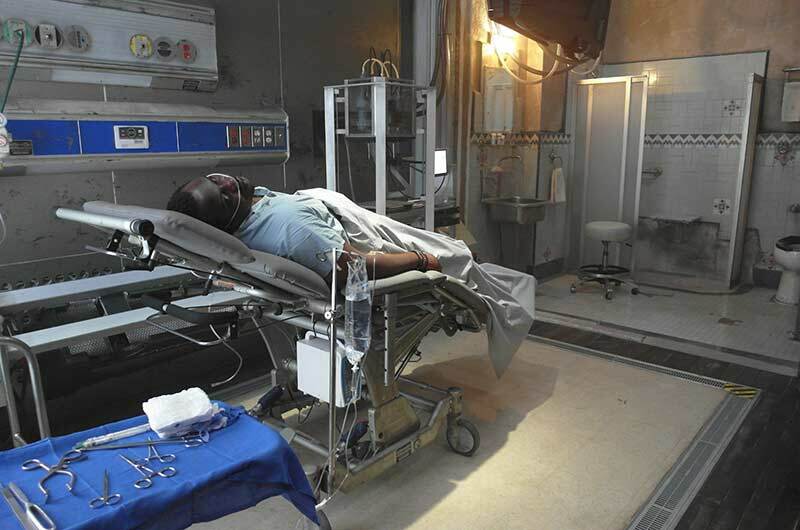 Among my favorite details when it comes to the set dressing, is ...you’re not allowed to bring weapons into the Artemis, because that would be crazy, it’s a hospital for criminals. Rosemary had found all these wonderful pewters and bronzes of stags, which all tied into the concept of Artemis...she was the goddess of the hunt and the hunted...and would have been part of the original hotel decor. But I said, “I don’t think the Artemis could have them anymore, because they look like weapons, and why are we making a big deal out of breaking a coffee cup to use as a weapon if we’ve got these things?” And Ramsey and Rosemary really brilliantly solved this. There are metallic strips that basically nailed the sculpture down onto a hard surface...with no apparent care of the value of the piece of furniture to which they’re being attached! A great touch. And it was one of those things where the reality actually informs the heightened fantasy in a way that gives it so much more personality and texture. 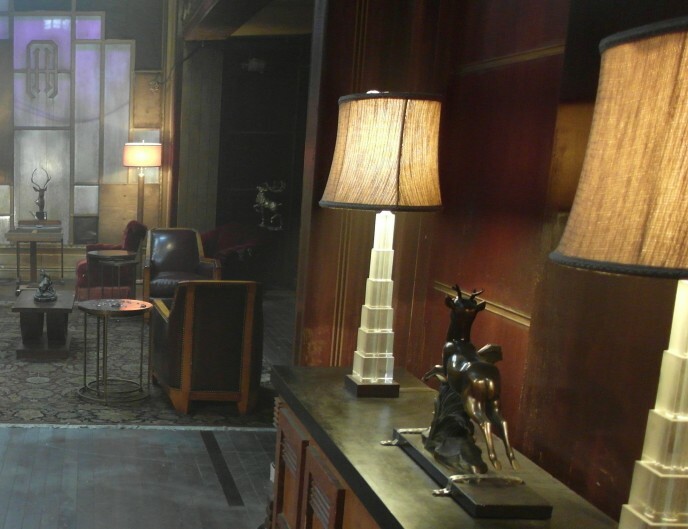 You’re surrounded by these incredible artists behind the camera, and I truly believe that set decoration is gigantic—it is an absolute art, you know? And so you would be a fool not to listen to those storytellers, particularly if they’re far more experienced in their job than you are in yours. Which was the case here, because this was my first movie as a director. We’ve split opinions, with the critics, but I’m okay with that. It was never supposed to be everyone’s okay movie. It was supposed to be one person’s favorite move. I think, when you’re bold, as we were in all departments, it’s going to divide people, particularly today. But I think it’s a badge of honor. I also think “style” and “stylization” can sometimes be considered a dirty word just because it can bump people’s internal artifice detector, and frankly, one of the things I think Rosemary did so brilliantly was fold enough reality into the Artemis that we were stylized as a concept but there was always something for me in each shot that grounded it. 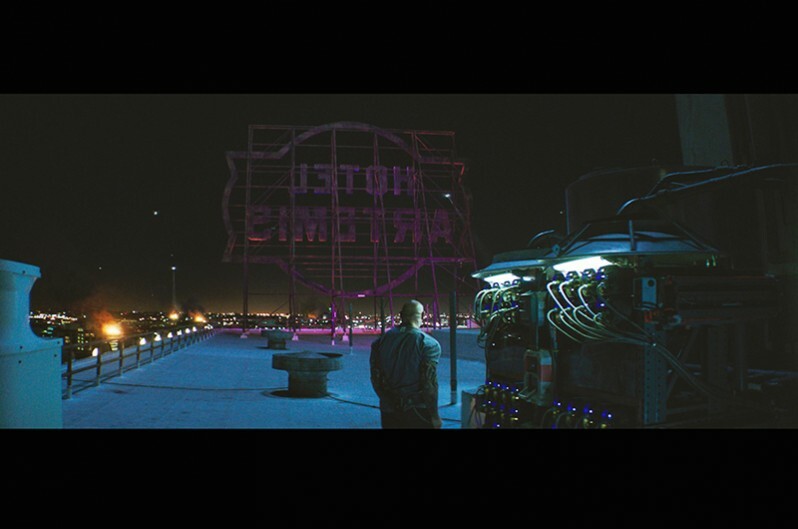 One of the things we talked about was the juxtaposition between the 2020s and 1920s, and to try to make sure there was an element from each in every single shot. So it was always telling the story of both time periods. 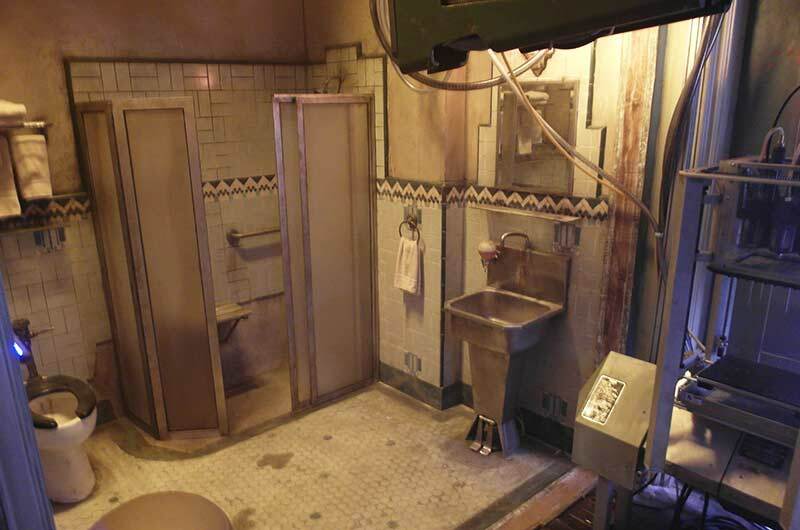 The bathrooms are fantastic, and a great example. Again, a lot of this is informed by the limited set footprint that we could afford. It’s just that idea that these rooms used to have bathrooms, but we knew we needed a bit more space in the room and a little difference in shape, so we had this idea that Everest had basically broken open the bathroom section in order to fit these sort of field operation units that take up half the room, this mini-arena where The Nurse operates with the robot arms and 3d printers and other high tech equipment. But also, there’s one little bay in each room where vintage, worn, but classic Los Angeles tiling is paired with 1970s steel hospital pedal sinks. Again, that juxtaposition is there in every kind of moment, and every frame, where possible. So we cheated accent tiles. We cheated the door frame panels. 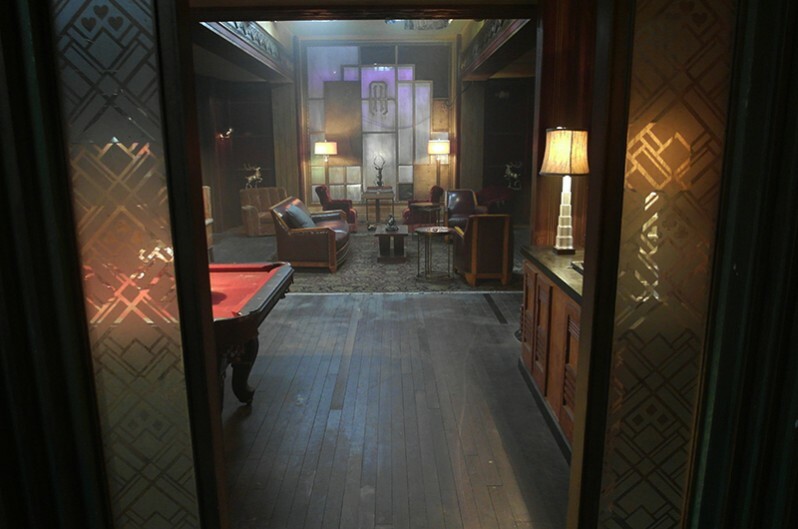 There’s a sort of lattice in the doorways of each of the rooms, and we swapped out the motif each time. So the Niagara one has a water motif, the Honolulu suite a subtle pineapple motif, etc. 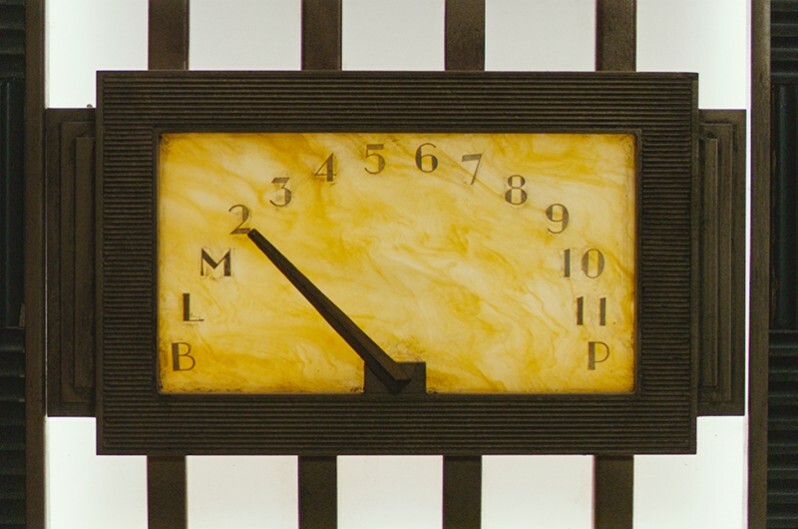 All of those little details swap out, and go a huge way to make it feel like an entirely different room. 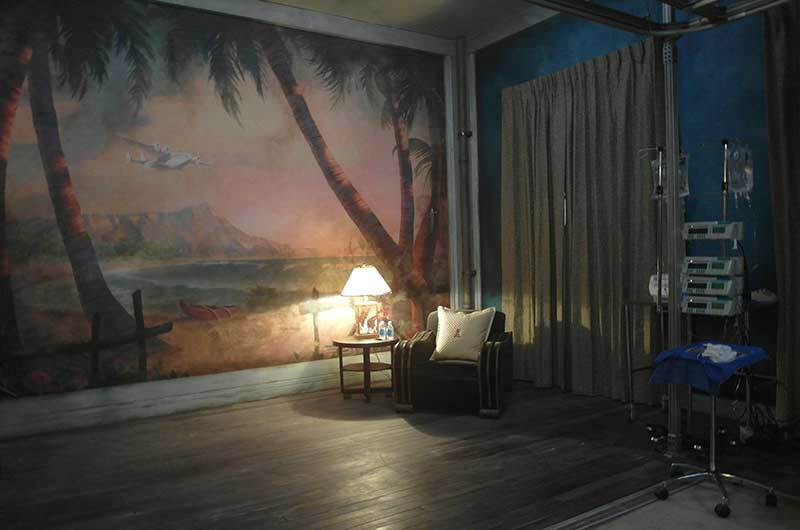 The Nurse’s room, the only room that someone actually lives in. It felt super important that The Nurse...her comfort music and her world...feels very much in another kind of LA lineage, the Laurel Canyon late ‘60s, early ‘70s scene. That plays into her character and her story. I believe in people having power eras, where they return for comfort to an era that they felt the most powerful and most safe in. That’s why The Nurse listens to that kind of music when she’s having her anxiety attacks in the movie. And that’s why I wanted her room to feel full of accents that were her safe place, frankly. And I also liked the idea that it felt like a nest. A place she never leaves. 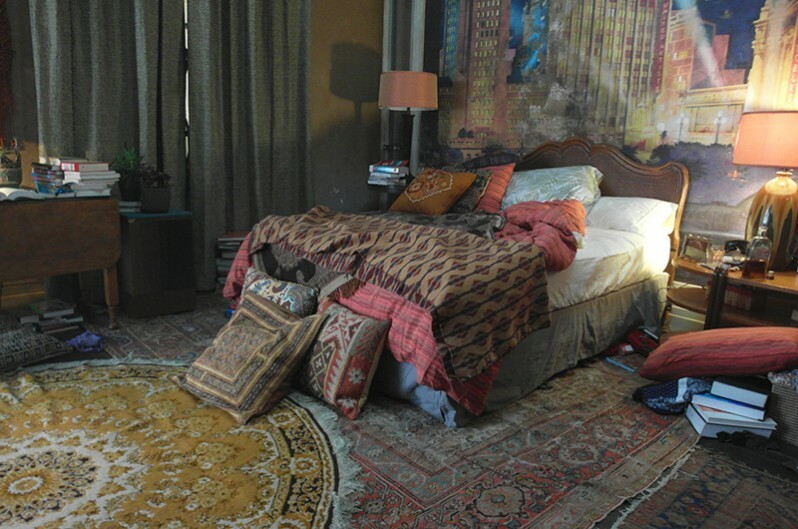 There’s a kind of yellow warm glow to her room and all of the fittings and furniture in there as well. It felt important that it should be the heart of her haven, her gilded cage that she’s built for herself. Clearly she has a vast range of doctoring skills, whether she was a nurse in the beginning or not. But one of the storytelling ways Rosemary and I thought to convey that was with stacks and stacks of medical books everywhere, that The Nurse would use to consult. 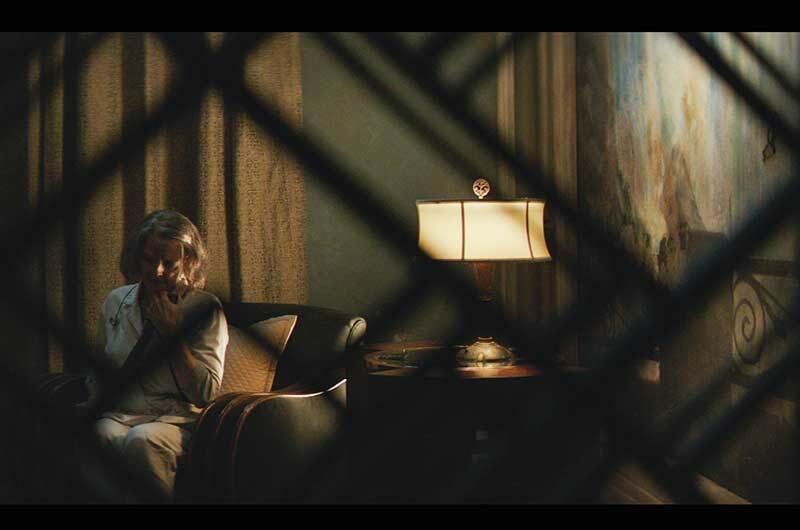 And I think it’s important that that room not only feel like a place that she has chosen to stay in but also, that The Nurse is kind of essentially blotting out her history, her past. I wanted that room to feel the most nostalgic of all. I think what you see is actually pretty much what I envisaged right from the beginning. As ever, the prosaic and the practical inform the creative. One of the reasons that I had the idea of each of the rooms being themed by a different holiday destination is because these are people who are all trapped. You know, the idea of this giant picture window to the world that they can’t get to is dramatically interesting as a juxtaposition. And the other thing that kind of informed it, there’s also a big Korean/Asian cinema influence. Rosemary and Ramsey, really tricked into that early on as well...textures and how faded you go with tones. And the concept that everything should be broken down, whether it’s technology or whether it’s a pillow from the 1920s, it should all be broken down to feel like it had been lived in, fought over and occasionally used for things entirely not of their point of origin. 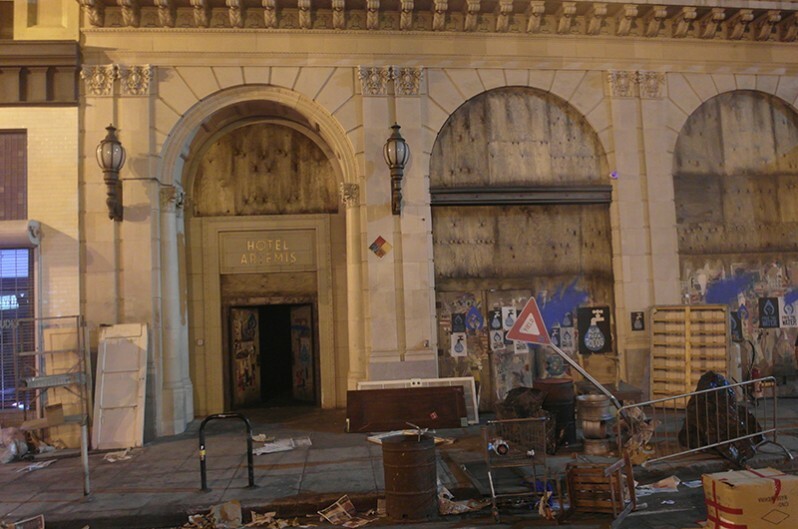 MacGyvering and kit-bashing were...well, luckily the aesthetic of the movie is the exact aesthetic that we had to approach the set design and decoration, and props design with. I don’t like to have something in a film that’s cool for cool’s sake. I like everything to have a story. So the idea was that The Nurse and Everest had been basically, with the WolfKing’s [Jeff Goldblum] money, populating this hospital with technology from the black market for 20 years...but it felt like it would have pieces of equipment that would have come from all over the world. Like the computer screens, the bane of Rosemary’s life, the idea for those was that they are Russian military medical field tech. 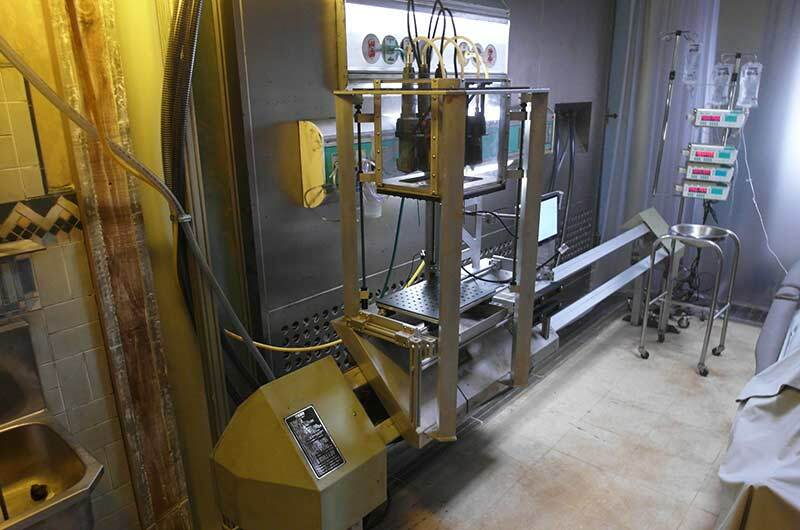 So instead of having holograms, if you were in the field and there were people injured, you would need a giant screen to show you what was going on inside of the person, with the nanonites and the robotic operation, but you would also need something that was wiped clean and could be easily erected. So that’s why we came up with those. 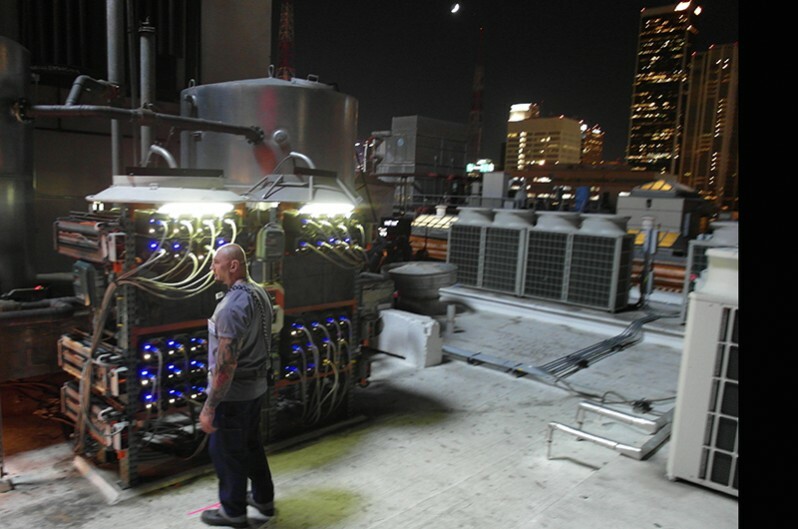 And that’s the same with the huge batteries on the roof, which are actually modeled on old Russian submarine batteries. The idea that they bought black market Russian submarine batteries appealed to us very much. 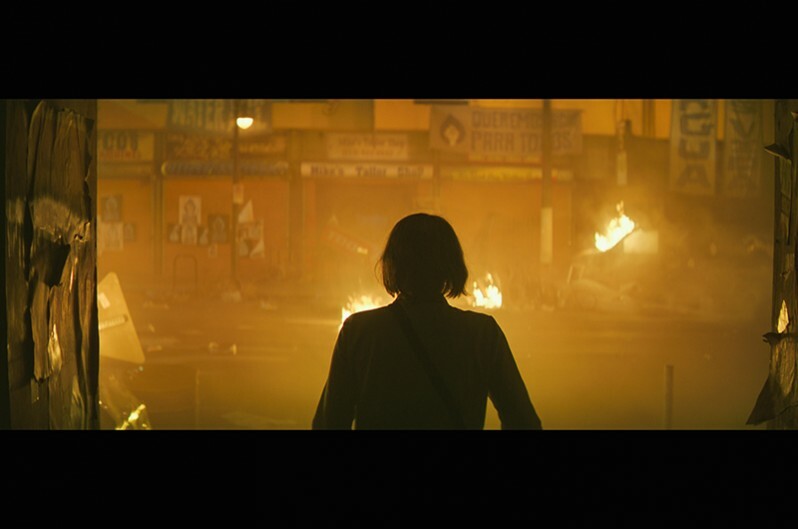 The interesting thing with the riot and the sense of outside versus the inside is when The Nurse finally exits the hotel, I wanted it to have a kind of hellishness to it, which again is very easy to say until you’re working with a very limited budget. And, again, I had this idea that the yellow colors would help define. The movie is a movie of 2 halves. The first half introduces all of the characters and it has them safe, and in the second half, safety is ripped away from all of them. 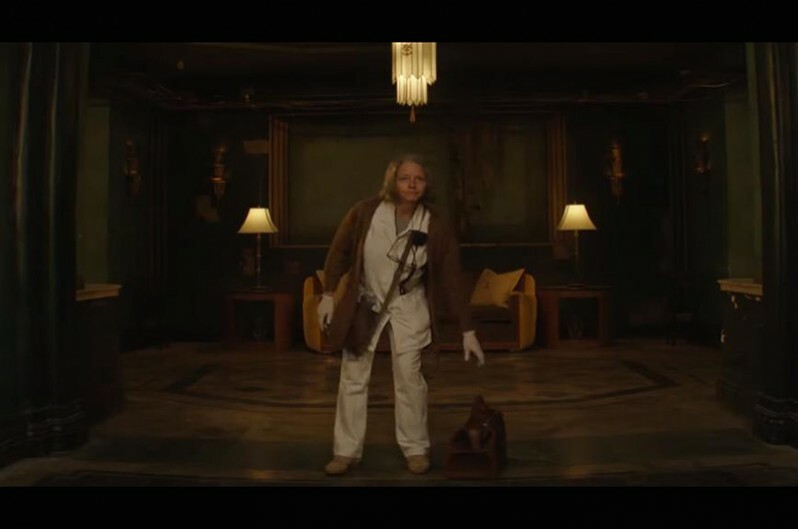 In the first half of the movie, yellow represents safety within the Artemis, and The Nurse in general. I like the idea that the yellows of the streets as we then enter into them at the end are essentially The Nurse coming into the most expanse of Nurse color that she had ever experienced. In fact, the final shot is of her disappearing into the fire frame of gold, which is what we associate with her in the beginning. And I wanted it to feel like, as much as it was terrifying to her, that that gold was actually her destiny as well, and her embrace of her past and where she should be. 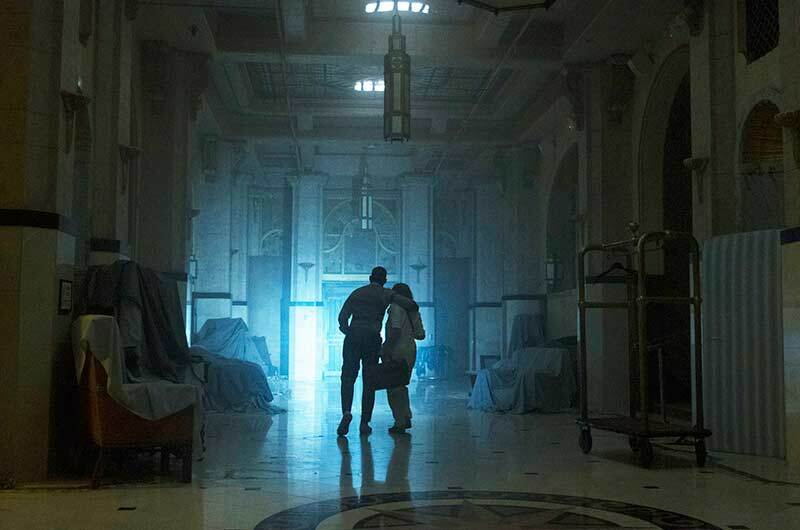 Set Decorator Rosemary Brandenburg SDSAI, who has worked on films of all sizes and budgets, from mega to minuscule, notes that whatever the size, your crew and your relationships with your resources are key.